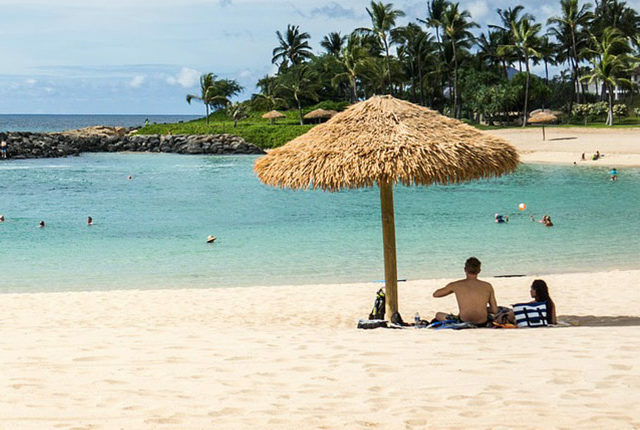 Traveling can be a relaxing getaway, a thrilling adventure, or a weary work trip. Stays can be short or lengthy, delayed or interrupted, and everything in between. We pack for climate, events, and the expected, but often our predictions are wrong and plans (and weather) change. 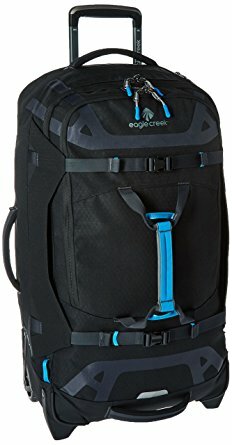 Lucky for you, Eagle Creek offers a unique line of luggage and accessories that directly addresses some of the challenges travelers face on their journeys. Here we will look at five of their top selling suitcases to identify which style might best fit your individual needs. Extended stays are easier with this large, multi-functional suitcase. This large check-in suitcase is made of a durable water-repellant fabric to minimize wear and tear and protect your belongings against the elements. 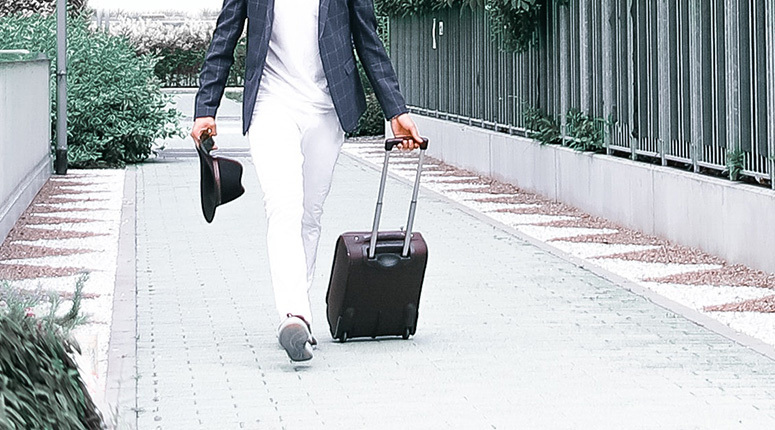 In areas where suitcases tend to bump and bang the most, a layer of armor has been added to further safeguard the exterior of the bag and minimize abrasion. Around the edges, there are also bumpers for additional protection. All this precautionary gear provides confidence that it will maintain its look and shape as it’s dragged along on your travels and tossed around at airports! In addition to its durability, the Tarmac also has some handy features that make this luggage more functional. There’s a fabric handle on the top, side, and bottom of the bag so picking it up and throwing it in the back of a trunk is less of a project. The main handle system on this bag is fully extendable so it is comfortable to move around with, and features a tray to help guard the handle system when not in use. This style only features two wheels, which isn’t ideal if you like to sometimes roll your suitcase flat. However, the wheels are oversized and have treading so they provide a better ride over bumpy or rocky surfaces than most suitcase wheels. The Tarmac also has some built-in safety features, such as lockable and puncture-resistant zippers. All of the zippers, as well as panel on the front of the bag, are reflective. I should also mention that this luggage features a few fun and functional extras, such as a “tuckaway” key fob, a compression strap that allows you to easily secure your coat or other items to the top of your suitcase, and an “add-a-bag” strap for stacking luggage — that also doubles as a bottle opener. Now that is pretty cool! The perks of a duffle bag with the convenience of a rolling suitcase. 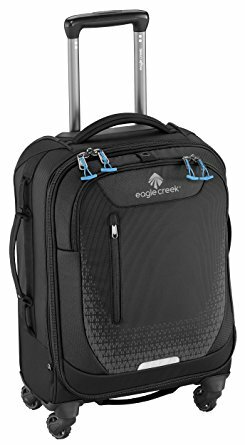 This Eagle Creek suitcase is essentially a duffle bag on wheels. 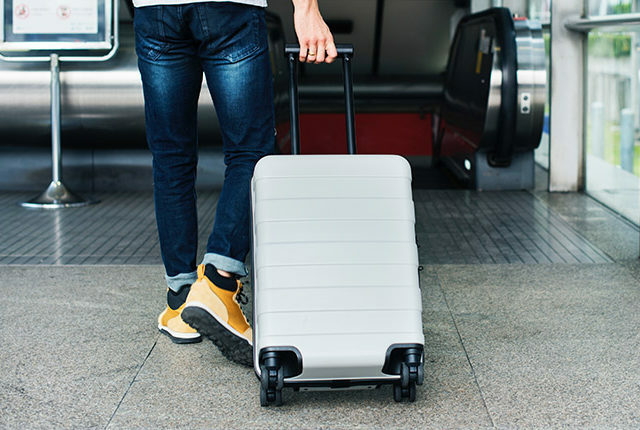 It combines the qualities of these two types of luggage to create a versatile option for carrying your items when traveling. It doesn’t look like your average suitcase but it’s not trying to. The No Matter What Flatbed luggage is for a specific type of traveler or someone taking a specific type of trip. Obviously it is an appealing option for extended travel, especially for those taking gear along with them. The frame is flexible, so you’re able to fit in items that can be awkward to maneuver in your traditional fixed-frame suitcase. Despite it being a duffle at its core, the fabric used here is actually quite durable. Made with Eagle Creek’s standard “Bi-Tech” fabric, it is both water-repellent and abrasion resistant. Duffle bags are great for packing in a ton of items but they can get pretty beat up. This bag’s fabric paired with the fact that it’s on wheels, eliminates a lot of the normal wear and tear. The No Matter What Flatbed features a sturdy handle system and oversized wheels for navigating from Point A to Point B. If you’re an adventurer, you’ll also appreciate the quick-stash pocket near the top handle, which is great for keeping any items you’ll need to access easily. When traveling with large luggage, small features like this can have a huge impact in improving the flow and functionality of your days. A seriously organized carry on suitcase that lets you jetset with less. 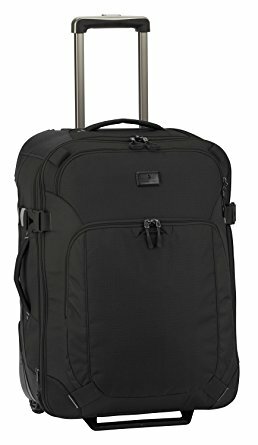 This lightweight carry on meets the size requirements for international flights and has four multi-directional wheels to easily move around airports. Each side has a handle as well, which you’ll really appreciate when lifting your bag up to or down from the overhead compartment. Often “lightweight” bags are kind of flimsy, but this suitcase manages to still be durable despite its dimensions. It is made of scuff resistant fabric and has bumpers around its edges. In addition to mobility, organization is key with any carry on because you want to be able to access items in your bag mid-flight if necessary. Good organization and lots of compartments also helps you optimize space if you are relying solely on your carry on. 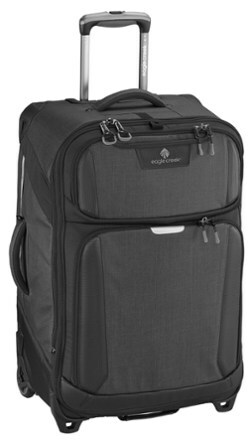 This Eagle Creek luggage checks a lot of boxes because of its organization-friendly design. In the front, you have a quick stash pouch for odds-and-ends and behind that is a separate padded compartment, perfectly sized for a tablet. In the main compartment, there’s a door panel pocket and an expansion zipper to let you get a little extra in there. It also has cool toggle zippers that you can thread through the bag’s central lock point to deter pickpockets from messing with your bag. A big bonus if you take public transportation when traveling. Never decide between your clothes and your gear again. 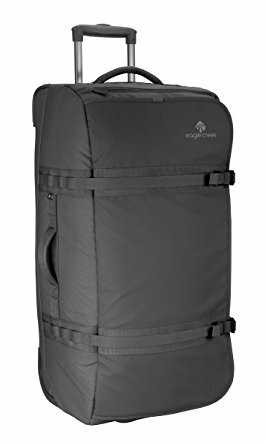 The Gear Warrior is another hybrid bag from Eagle Creek. It combines a suitcase and a duffle bag, providing a practical solution for those traveling with clothes and gear. Exterior straps make it easy to attach gear to the outside of your bag, and a second interior compartment has been included to separate dirty gear (or clothes) from the rest of your belongings. The mobility and functionality of this bag are great. It has an extension handle and two wheels if you want to roll it, and a top, side and front grab handle for when you’d rather carry it. You can even zip up a cover on top to hide the extension handle when you check the bag or are carrying it as a duffle. As far as durability goes, this luggage far exceeds your typical duffle bag. They were crafted to withstand airplane travel, roof rack rides, and outdoor excursions so they are much tougher than you’d expect. 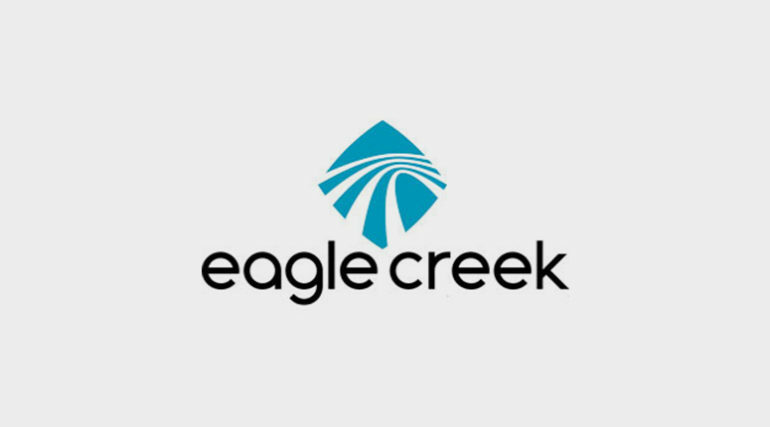 Eagle Creek refers to this strength as an “exo-skeleton” which is an exterior protection against abrasion. Its fabric is water resistant, and it has side wings that cover the zippered areas to provide an extra shield against the elements. 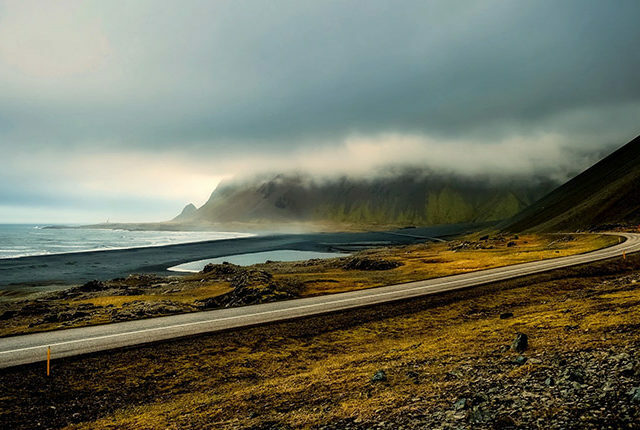 For adventurers, these benefits come into play while traveling and also after you arrive at your destination. Keep your luggage light and get more suitcase with less. This medium-sized bag provides enough room for your items without slowing down your travels. (Let’s be real. You don’t always want the biggest bag but you’ve got a lot of stuff!) It has exterior compression straps and its expansion capabilities provide 15% more room when released. Just in case you do overpack. You can also attach a second bag by using the built-in clip. With a name like “Adventure” you have to assume this luggage is super durable, and it definitely has some features to validate its name. Along the bottom of the suitcase, you’ll find a ton of reinforcement like the corner bumpers and kick plate that you’ll see on a lot of Eagle Creek bags. Its wheels are over-sized and treaded, so if your trips tend to include some cobblestone or rough terrain you know you’re covered. Safety-wise, you’ll find a hideaway luggage ID tag, lockable zippers, and reflectivity. The extra front compartments and key fob help keep you organized. Overall this is a great medium-sized bag that is lightweight and durable, and maximizes its space. Suitcases aren’t one-size-fits-all and Eagle Creek provides a variety of bags with unique features to suit all types of travelers. Whether you’re a weekend warrior, outdoors adventurer, or casual jetsetter, you have specific suitcase requirements. Hopefully this guide helped you find a bag that will make your travels more seamless and less stressful.